Often associated with Country and Western music - such is the might of their PR machine! Line dancing has been around much longer than Achy Breaky Heart, which most people remember and we have never danced. Have a look through our A-Z Dance List to see the range of music that is played and the dances we have taught over the years. 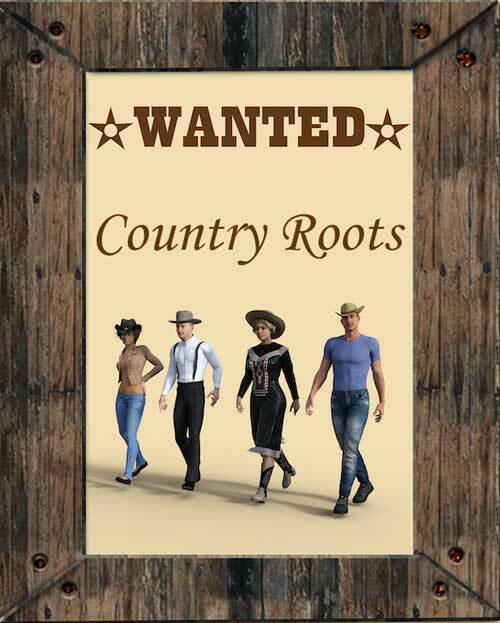 Yes - we do use modern Country music but line dancing has moved on a lot to include many styles of dance such as Latin American - Cha Cha, Samba, Swing/Jive, Salsa and Mambo and from Ballroom - Waltz and even Tango. Learning solo dancing first can help you move on to partnership/couple dancing in both the Country styles as well as Ballroom and Latin. We keep alive the best from the 90s but we teach 'modern' dances too - many of our dance sheets now include the date they were choreographed, We use these instructions to make sure what you dance is correct - some may just follow a YouTube video without checking the intended steps. Steps and dances for the complete beginner in modern line dancing - we teach choreography from the 21st century as well as old favorites from the last. The step patterns used in dances we teach are a good introduction to other dance forms. Cost for this stand alone lesson is £3 on the night. We do not charge in advance so no ticket is required and we do not tie you into a course but regular attendance is encouraged. We can provide a taster in modern line dance for an adult audience - you do not need to be an LGBT group. We use Bootstrap and FitVids.